With the state of the current economy, budget constraints for many businesses and corporations are becoming much more evident, none though made more noise than Blackcats extreme budget cut on fuse length. CEO of Blackcat Fireworks Neil Barclay stated firmly in his press release early Tuesday morning wielding a glass of what Barclay claimed was iced tea, “Here’s the deal, we’ve had a lot of lawyers and hospital bills repeatedly sent our way, but people just need to figure out that fireworks are dangerous, you mess with the CAT, you’re gonna get burned” in reference to the company’s most highly explosive line of semi-illegal fireworks CAT, which saw the harshest of the fuse budget cuts. 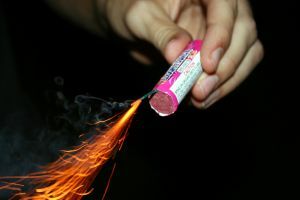 This July fourth weekend had Texas hospitals reporting a record-breaking number of fingers blown off, up an astonishing 8 percent from what some medical professionals would already refer to as “an outragious number of fingers”, as well facial gunpowder burns and singed eyebrows were up 56 percent. Barclay denied to tie the undeniably strong medical evidence to that of his outrageously large fuse budget cuts, simply shrugging off the unidentified persons question, with his hand in a sweeping motion across the podium saying “next”. Barclay soon stumbled off after downing his iced tea, leaving interrogations to his VP of public relations, who was slammed with a barrage of serious legal questions for nearly four and a half hours. Timothy Roy Timmins 19, local of Dustbin trailer park which saw a good proportion of severe explosion related amputations was quoted by press when leaving Memorial hospital on the 4th with six reattached fingers speaking with enthusiasm “those fuses are wicked short this year!”. Texas still remains firmly seated as the finger blowing off capital of North America. In entirely related news trailer park fires saw an insane 114 percent increase.